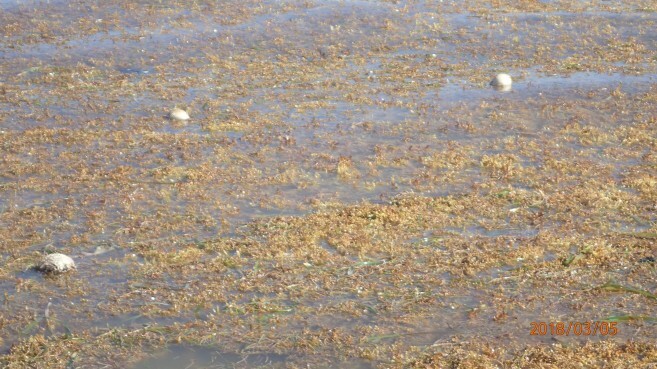 The influx of Sargassum seaweed has been accumulating along the coast of Ambergris Caye and nearby islands for the past several weeks. 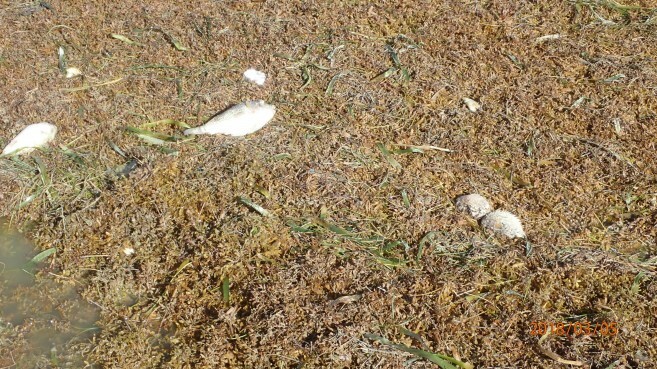 The thick accumulation of these sea plants on the coastline is apparently causing detrimental effects on certain fish species as residents have reported dead fish along the shores. The Hol Chan Marine Reserve was made aware of dead fish and considered that the excess of Sargassum in certain areas of the island might be the cause of their death. The reports made by alarmed residents show images of a specific type of fish that is being affected. From a first glance it resembles a puffer fish, but after Hol Chan took a look at the images they were able to identify the species as a Striped Burrfish. “This type of fish lives close to the shoreline and is commonly found in lagoons and seagrass beds,” explained Alamilla. The local authorities have been working along the beach trying to remove as much Sargassum as they can. While, the different restaurants, hotels, and bars along the beach have also teamed up to try to clean the beach as it is affecting their businesses as well. 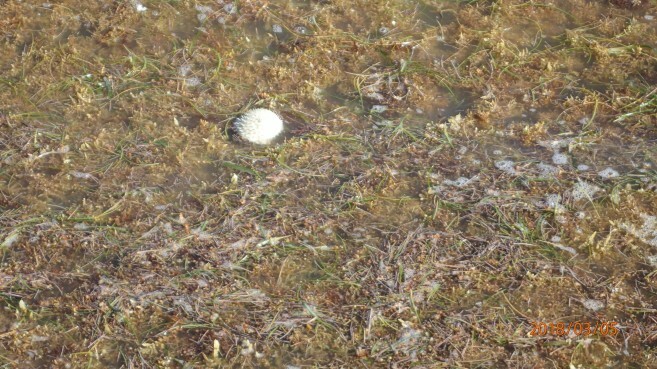 The idea to use Sargassum for the landfill has been discouraged by some residents who have resorted to this method in the past. According to them, Sargassum continues to further decay once it is buried and this can result in the land on top of it to cave in. The problem is not just affecting Belize but many other parts of the Caribbean where thick Sagassum mats are choking water bodies and beaches. According to recent research, a potential culprit for the unusual Sargassum bloom over the years may be climate change. 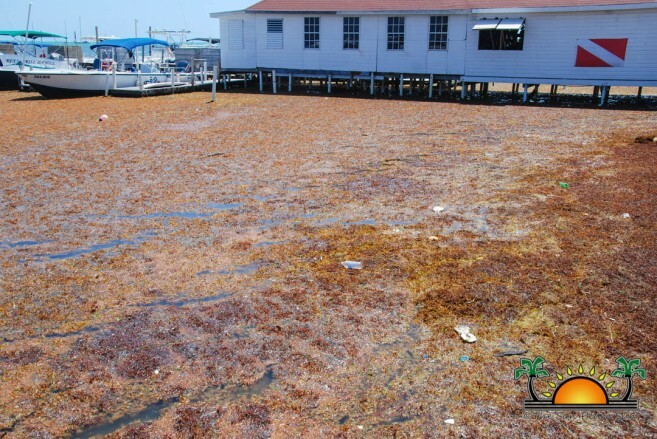 It is known that Sargassum thrives in warm and well-fertilized waters. With the effect of global warming and the run-off of nutrients from agricultural fertilizers into the sea, this may explain the spike in the blooming. According to research the additional nutrients flushing into the seas are coming from fertilized-based farming industries which add substances to the soil such as phosphates and nitrogen. The reports indicate that the recent massive bloom is coming from a region east of the Amazon River in South America. It is believed that one of the main causes is deforestation leading to erosion combined with the birth of industrialized farming in countries such as Brazil. The washing away of excess nutrients from such developments into the water has contributed to the amassing of the algae. The other issue that is attributed to the extended accumulation of thick Sargassum mats on coastal communities is the slowing down of the Gulf Stream current out of the Caribbean. This stream is the transporter of Sargassum through the Gulf of Mexico and out to the north-east Atlantic Ocean. As evidence shows, the slowing down of this current and the warming waters due to the greenhouse gasses that continues to overheat the planet, Sargassum has found the ideal environment to growing and blooming like never before. The unusual bloom has been noticed since the 2014 and continues to steadily increase, leaving many beach areas covered with the sulfur-stink of the decaying biomass. The algae are not all that negative as it provides food to certain fish species, turtles and even birds. However, when the Sargassum production becomes out of control it can become a danger to marine species. Besides depriving species of oxygen, turtle nests and hatchlings become affected by the algae. Larger fish such as sharks and rays have difficulty in mobilizing due to the thick sections of the Sargassum. All in all, the waters become toxic, causing the demise of native marine species that cannot survive in the hydrogen sulfide and sulfur producing habitat. In previous years, leaders of the Caribbean nations have met to try to find a solution to the issue. During a symposium held in 2015 at the University of the West Indies, its Vice-Chancellor Sir Hilary Beckles indicated that it would take at least US$120 million and more than 100,000 people to clean up the Sargassum. The invasion of the seaweed is considered an international crisis and the greatest single threat to the Caribbean. In his presentation, Beckles suggested that the international community should step in to provide needed assistance. The seaweed has been inundating several beaches across the Caribbean. 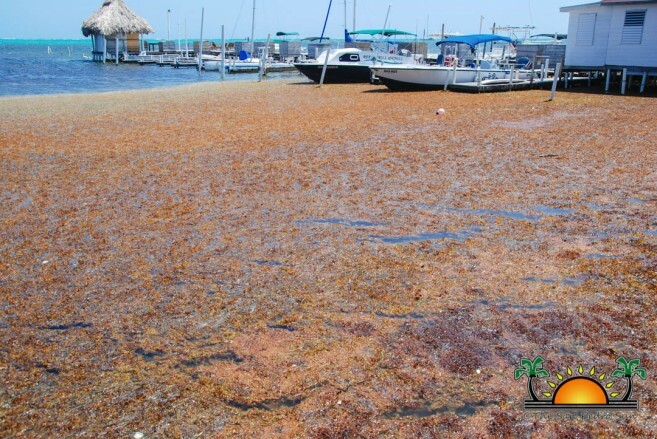 In Belize the invasion of Sargassum has become an annual event, covering the shores with thick mats. Residents along the coasts of Belize have learned to live with the presence of the seaweed, but they do recall years ago, the Sargassum was a seldom visitor. Sargassum has been around for centuries and was witnessed by Christopher Columbus when he voyaged to the New World. When ancient sailors crossed the North Atlantic they often passed through the Sargasso Sea. It is said that it was a notable feature as the floating mats were sometimes dense enough to halt the progress of their vessels. Some of the first maps showing regions of low and high concentration of Sargassum in the Caribbean and North Atlantic Ocean date back to the 1890’s. While Sargassum seems to be a headache for many Caribbean nations and within the region due to its negative impacts to certain species living along the shorelines, there are organizations that thrive to preserve it. The Sargasso Sea Alliance is an organization that has been actively working to conserve this unique marine ecosystem. The Alliance was recently awarded the ‘Hamilton Declaration on Collaboration for the Conservation of the Sargasso Sea.’ According to the Group, the non-binding political statement indicates signatories’ interest in efforts to conserve the Sargasso Sea. The declaration was signed by the United States of America, Bermuda, the Azores, Monaco, and the United Kingdom. The Sargasso Alliance also states that the seaweed ecosystem plays an important role in marine ecology on the high seas and should not be permanently eradicated. Photos:San Pedro Lobster Fest 2012 was bigger and better!